How many numbers do you have so far? The competition runs from the 1st day of the month through the last day of the month (EST). This competition is open to all depositing players. 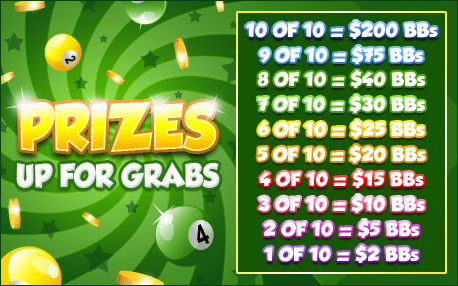 To win any bonus in the competition you must win on at least one of the competition numbers while a CM is working in your room. Wins on any of these numbers while a CM is not working in your room will not contribute to this competition. You must track the game ID of each game you win one of these numbers on as this information would be required by management in the event of any dispute. Competition winners will be credited and emailed on the 1st day of each month. Competition payments will be in the form of BBs. The decision of Management is final and no correspondence will be entered into.